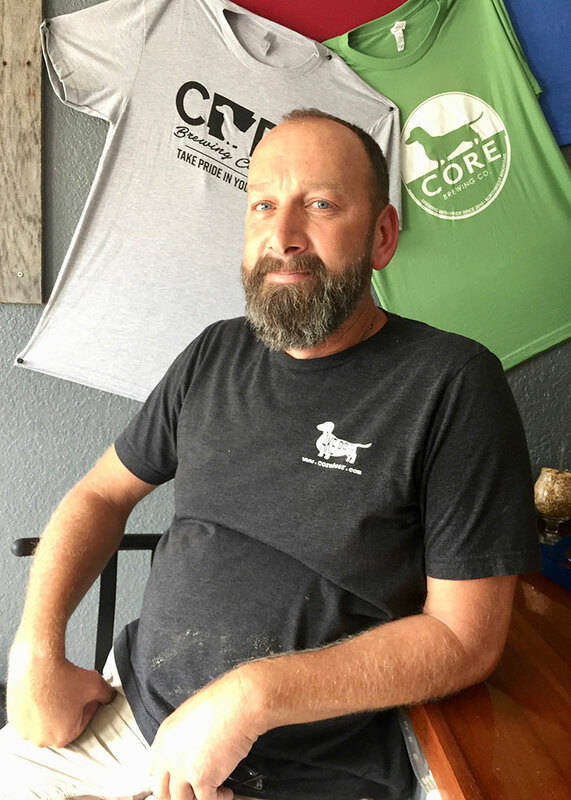 Core Brewing Co. has suffered from mixed opinions since it was founded in 2010. On one hand, the brewery is celebrated for being a pioneer in local brewing. When Core opened it was the only brewery in the region other than Hog Haus Brewing Co. The recent wave of craft brewing in Northwest Arkansas had yet to begin. Founder Jesse Core started with a one-barrel system and refined his recipes based on customer feedback. 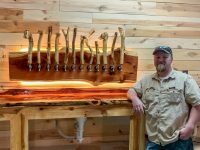 He moved his operation to its present home in north Springdale in 2012, and ramped up production behind the muscle of a new 25-barrel brewhouse. Core was fueled by external investment and plans for aggressive growth. It was way out in front by the time other breweries in the region came into existence. On the other hand, some area beer drinkers lamented the boring and often inconsistent nature of the beers being produced. While some stood out, other beers were middle-of-the-road or vastly different batch-to-batch. Core — and particularly its founder — became known for a brash attitude that was different than what many had grown to love about craft beer culture. Instead of the more typical laid-back approach, Core shook his fist in consumers’ faces and demanded they drink his beer (metaphorically speaking, of course). Last month Core announced a leadership shakeup that nudged its founder from the CEO role, and resulted in the promotion of two key members of the brewing team. Ron Schmidt was named director of operations. Rodrigo Medina was appointed head brewer. Neither brewer has a long history in brewing, yet both are intent on changing the reputation Core has in the region. I talked to Schmidt prior to the announcement of his promotion. The 50-year-old San Antonio native and Army veteran was tinkering with some equipment when I arrived at the brewery. It wasn’t that long ago that Schmidt was tinkering with brewing equipment in his garage. He picked up the hobby after a foot injury ended what he refers to as a “semi-professional” triathlon career. A few years ago, after arriving in Northwest Arkansas, he was looking to get his foot in the door at a local brewery and was hired by Core to deliver beer. Unfortunately, the brewery signed a deal with a distributor soon thereafter. He really wanted to be a brewer but didn’t have the credentials Core was looking for at the time. Suddenly he was out of a job. He later returned to Seibel to complete the long course in brewing. Schmidt was active in the local homebrewers club, The Fayetteville Lovers of Pure Suds (or FLOPS for short). A couple of years ago he helped plan a competition between FLOPS and another club from Benton County. Jesse Core expressed interest in hosting the competition at the brewery and set up a meeting with Schmidt. Instead Core offered him a job as a production brewer. It wasn’t long after Schmidt was hired that the head brewer departed. He and Medina – who was hired around the same time — moved up the brewing hierarchy as a result. But he is first and foremost a brewer. He and Medina have been experimenting with recipes since they arrived at Core, and over the last few months their creations have started hitting the street. The goal is to phase out some of the older beers in the Core lineup and introduce new flavors and styles. Albatross — a New-England IPA — was one of the first to join the slate of year-round beers. Other new offerings include E-Stop (pale ale), Ouachita IPA, and Warthog (Munich-style Helles). According to Schmidt, the days are numbered for some of Core’s original lineup. Leghound Lager, Behemoth Pilsner, and the brewery’s former flagship, ESB, will soon be gone. As for the morale in the brewery, Schmidt sees improvements there, too. Medina wasn’t available for an interview the day I talked to Schmidt. By the time I returned, the organizational announcement had gone public, and Medina was officially Core’s head brewer. Medina was born in Bolivia and moved to the area in 1999. The 27-year-old is a graduate of Fayetteville High School and attended the University of Arkansas, where he studied kinesiology and hospitality and restaurant management. He hopes to finish his degree at some point in the future. Because of his immigration status, Medina had some free time on his hands while waiting for his work authorization to be approved by the federal government. It was during this time — the fall of 2015 — that he started home brewing. “Essentially, my background in brewing came from wanting to brew some of the beers I was trading for,” he said. One of the first recipes he brewed was provided by a friend who golfed with Noah Bissell of Bissell Brothers Brewing Co. in Portland, Maine. Medina said he was hanging out at Fossil Cove quite a bit back then. He was interested in becoming a professional brewer, but wasn’t sure how to break into the profession. Then one day he pulled up a chair at a table occupied by a local beer retailer. They struck up a conversation and became fast friends. That retailer eventually passed Medina’s name along to Core, who was looking for new talent for his brewhouse. Jay Means — who is currently brewing at Bike Rack Brewing Co. in Bentonville — was also at Core at that time. He took Medina under his wing and showed him how things worked. 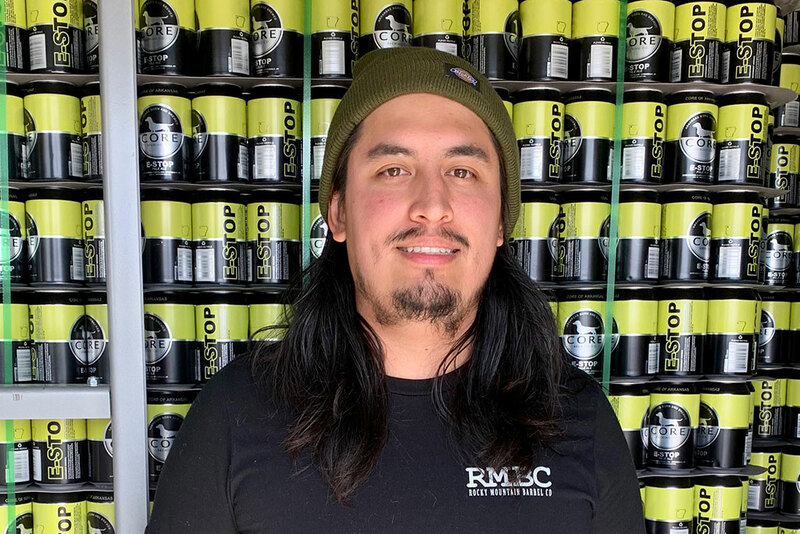 Medina credits Means for helping him grow as a brewery employee. It wasn’t long before Medina was looking to move from the cellar to a more central position at Core. He sensed the head brewer at the time wasn’t giving it his all. There was room to improve the beer, and Medina couldn’t resist the urge to sell his potential to the company founder. “I would bring my homebrew here to push on Jesse because I felt from the get-go that the lead brewer back then wasn’t into it,” he said. Core was impressed with what he tasted, and immediately put Medina to work on the pilot system. He and Schmidt started brewing different recipes every Friday. Albatross and a series of pale ales called Beach Rat were born on that one-barrel setup. It wasn’t long before the pair was brewing beer on the big rig. Medina is excited about his promotion, and upbeat about the direction the brewery is headed. So far, the battle of the brewers has produced a couple of winners. Round one went to Medina’s Last Stage at Hawksbill, an IPA dry-hopped with Mosaic, Summer, Enigma, and Vic Secret. The round two winner was The Dude Abides, a white Russian imperial stout created by production brewer Alton Heubner. It is currently available on draft at Core pubs. More battles — in which winners are determined by customer votes at the pubs — will take place in the future. And there are plenty of non-battle beers in development too. Cranberry Rye — which is intended to counteract the pumpkin spice overload of the season — is an IPA brewed with cranberries, sweet orange peel, and rye malt. A double IPA developed by Schmidt is in the hopper and should be ready for release soon. 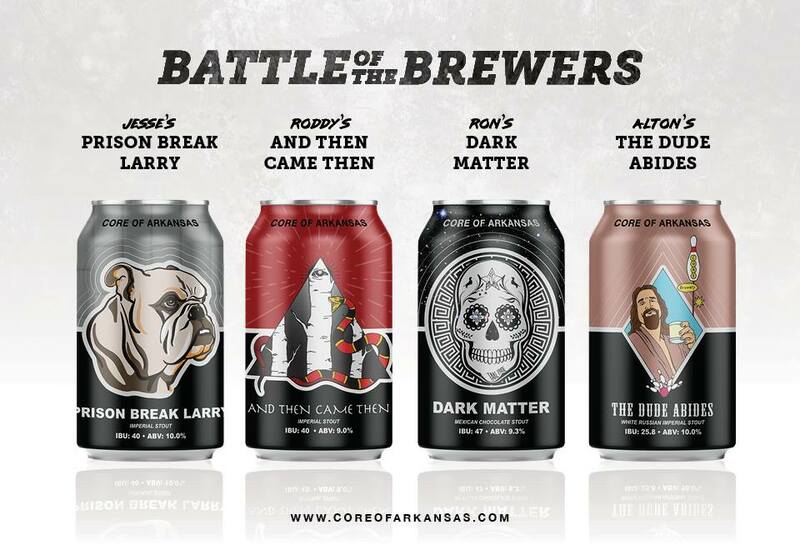 Core Brewing Co. is an O.G. of the Arkansas brewing industry, and much of the credit should be given to its founder, Jesse Core. He is a passionate businessman and talented brewer who has fought hard to get his namesake brewery to where it is today. And where it is today is impressive. Core is the second biggest brewery by volume in the state of Arkansas, with just under 4,500 barrels produced last year. That’s an achievement, no matter what people think about the brewery, or how brash its founder has come off in the past. Now there’s fresh blood in the brewhouse and change is afoot. Ron Schmidt and Rodrigo Medina are embracing the opportunity, and hope to take the Core brand to the next level.